Every room can benefit from a style upgrade, and our selection of affordable laminate flooring can take your home to the next level. Not only are laminate floors durable, but the low price tag means that this outstanding flooring option is suitable for any home improvement budget. A laminate floor installation can accommodate the existing décor of a room or become the foundation of your new choice in style. Our flooring warehouse has countless types of flooring in stock and ready-to-order, including laminate wood flooring and laminate tile flooring options. You'll find everything you need to transform your house into a stylish home. The affordability and ease-of-installation of laminate flooring make it suitable for any project, and we offer start-to-finish support from flooring sale prices to guaranteed laminate flooring installation. Laminate wood flooring is the best way to enhance the aesthetics and value of your home. This cost-effective material is manufactured from composite wood that has been pressed together at high temperatures. After this important step, an image of real hardwood is printed in laminate atop the composite wood. By choosing affordable materials for manufacturing, you will save on your laminate flooring installation. And, because laminate wood floors are made out of pressed wood, they have high durability. This allows them to resist scratches, keep out moisture, and endure wear and tear over long periods of time. You will also discover that laminate flooring is easy to clean and will not fade in sunlight. When you are considering the range of materials available for flooring installation, you'll find that laminate tile flooring is one of the best options you have. Manufactured from durable, easy-to-clean, man-made laminate material, this type of tile flooring is simple to install. Laminate tile flooring resists cracking under pressure, making it a top choice for homes with pets or children. Because laminate tile lies flat, there are no grooves or cracks, making it easier to clean the floor with a broom or mop. The smooth texture also enhances the dirt-cleaning and spill-resisting ability. One of the key advantages of laminate flooring is the affordability. You can install each laminate sheet as a whole, rather than needing to cut individual pieces, covering more floor for less. A tongue-and-groove locking system replaces the usual glue or adhesive-based installation with most types of tile, making laminate tile easy to install. There are more and more styles of laminate tile available every day. This means you will be able to find the perfect choice of flooring to match your room's walls, décor, and furniture. If you ever change your mind about the style, laminate tile flooring is also simple to switch it out at little cost. Replacing it is relatively simple because there is no adhesive involved. This means no sticking to the floor underlayment beneath. To help you choose from our tremendous collections, we have implemented the Five Star Selection System. This independent rating system clearly marks all of our flooring options from one to five stars, denoting the length of warranty and level of support. By using this system, you will be able to easily balance your savings and warranty needs, letting you get the most floor for your money. Call or come in today to browse and buy from our laminate selections, which are a perfect combination of style and durability. Count on our guaranteed laminate flooring installation to get the job done right the first time. Many of the problems with flooring are caused by improper installation at the start. For this reason, our professional installation carries a lifetime guarantee against installation errors. Laminate flooring provides a number of unique advantages that make it a go-to flooring option for any application. The unique construction of laminate makes it durable under high traffic while retaining a flexible style. The four layers of laminate work together to present combined advantages. The durable core is tightly compressed for a springy feel, which is especially useful for kitchens and other work areas. The core is backed by a water-resistant layer to prevent floor rot, while the surface is sealed against scratches and stains. The key to flexible style of laminate floors is their image layer. This layer can be printed in any color and pattern, and is often created to mimic natural hardwood, tile, or stone flooring. Looking for a low-cost solution to your flooring needs? 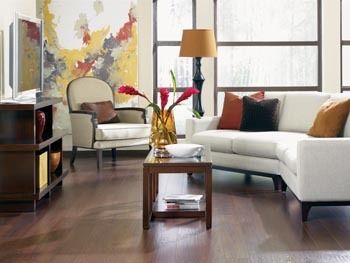 Laminate flooring delivers a luxury look at a price that fits any budget. Each of these materials is built to last for many years to come. When you choose laminate, you can trust that you will not have to replace your flooring. You will enjoy beautiful floors in every room without stress.No matter what your needs are, you will find that laminate flooring is the perfect fit for your home. This affordable and durable material offers an easy solution to each of your design goals. Because laminate is built to last, it will hold up to years of wear and tear. Whether you drop a heavy object or spill a hot liquid, your floors will stand up to nearly anything.